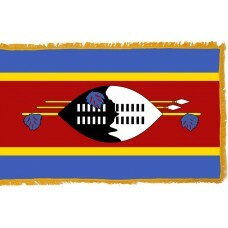 The Swaziland Flag features three horizontal bands in the colors of blue, red, and blue. The red band has yellow borders and is also double the width of the blue bands. In the center of the red band is a black and white "Nguni Shield" that is covering two spears and a staff (which is a long stick used as support or as a weapon). The staff is decorated with feathered tassels, known as "injobo." 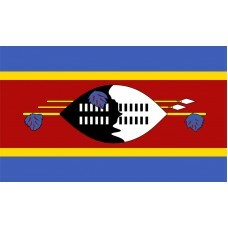 The blue color on the Swaziland Flag represents peace and stability, the red color represents the country’s past struggle, the yellow color represents the mineral wealth and resources of the country, and the black and white color of the shield represents the black and white people of the country living in peace and unity. 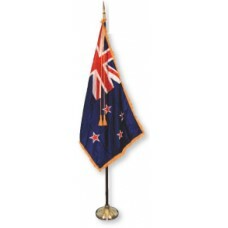 The shield, spears and staff represent the protection from the country’s enemies. The Swaziland flag was first risen on April 25th, 1967 following the pledge of oath that was taken by the King and was officially adopted on October 6th, 1968 which was exactly one month after Swaziland gained independence from the British on September 6th, 1968. Swaziland is the smallest country in Africa. It is a landlocked country that shares borders with Mozambique and South Africa (the majority being South Africa). Swaziland is also known as "Ngwane" or "Swatini." Swaziland's name is derived from King Mswati, who was considered to be the greatest fighting King after a battle with the Zulu tribes for the throne and "Swazi" is an anglicized version of his name. The largest and capital city is called Mbabane. Swaziland is the only country in Africa that still has an absolute monarchy. 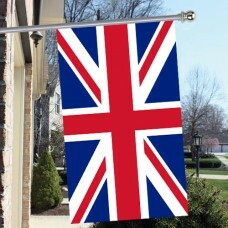 The country is ruled by the King and a Queen Mother. The King is considered to be the "father of the nation" and is known as "Ngwenyama" (which translates as lion). The Queen mother is considered to be the "mother of the nation" and is known as "Ndlovukazi" (which translates as elephant). The current King is King Mswati III, who has ruled since 1986. Swaziland's economy is reliant on agriculture, forestry, and mining. Tourism contributes slightly to the economy. The most visited site in Swaziland is the "Milwane Wildlife Sanctuary" which is the oldest protected area in the country. It is located in Ezulwini Valley (also known as Valley of Heaven) and is home to much wildlife. The "Malolotja National Park" is also very visited as it is home to some of the oldest mountains in the world and approximately 300 bird species. The Swazi Cultural village is popular with tourists as the small village displays the ancient traditions and styles of life before Swaziland became a British Protectorate in 1903. The village consists of 16 huts, Kraals, and byres for the livestock all made with traditional material, such as poles, grass, reeds, earth, and dried cow dung. As well as these, Swaziland is also home to the "Ngwenya Mine" which is the world's oldest mine and to the famous "Swazi Market" that can be found in the capital of Mbabane.